American Sutra: A Story of Faith and Freedom in the Second World War by Duncan Ryuken Williams revisits Japanese American internment through the lens of Buddhism. Williams begins as World War II breaks out and Japan becomes an enemy of the United States. He examines the Japanese Buddhist communities in Hawaii and the mainland, how Buddhism’s role in the community impacted the decision making around who was interred and in what sequence, how Japanese Christians fared in comparison, how internees found ways to adapt Buddhism for strength and survival, how Japanese Americans fighting in the war petitioned for their own priests and proper death rites, and countless individual stories. This is an academic book, so it’s not for the faint of heart, nor is it what I would suggest as an introduction to the history of Japanese American internment (if you’re here, reading this, I can only assume that you don’t need such an intro), but what it does offer is a detailed, thoroughly researched, and thought-provoking new angle. Religion offers an important lens, understudied and under acknowledged. Williams offers multiple views on its role, from Buddhism being another way in which Japanese were identified as alien, to its ability to offer solace to a Japanese American soldier being tortured in the Philippines. And though covering a dark chapter in American history, Williams pitches this as a hopeful saga about American multiplicity, religious freedom, and offers a timely call for inclusion over exclusion. Author JeffPosted on November 28, 2018 November 24, 2018 Categories Business, Discrimination, EducationTags names, Santa Clara County, studentsLeave a comment on Having a Hard to Pronounce Name: Does it Make a Difference? “Earlier this month, Jevh Maravilla and Christian Toldeo became viral superstars because of a mock poster they created and hung on the wall of a McDonald’s restaurant in Pearland, Texas. It featured themselves in an apparent advertisement for the fast food chain. Inspired by ‘Crazy Rich Asians’ for representation, Jevh and Christian were motivated to have themselves represented. Imagine making onto to national TV and getting a surprise $25k for a prank! I’m looking forward to seeing this at a local McDonald’s hopefully. Asian Americans have had a long history with US Armed forces, as we have written about before. I grew up surrounded by Filipino American Navy Veterans and their families, and I lived the Navy Brat lifestyle. When looking for stories about veterans, I found this profile on prominent and historic Asian and American and Pacific Islander Army veterans. It is notable for acknowledging the long history of Asian American veterans and for having one particularly notable omission. A description of Senator Daniel Inouye was not surprising – I definitely expected someone from the 442nd regiment to be included. Also not surprising was the inclusion of Senator Tammy Duckworth, who lost both legs in the Iraq War. I didn’t know about Congresswoman Tulsi Gabbard, who is still serves in the Hawaii Army National Guard. The picture above is of that Edward Day Cohota. Born in China, he fought in the American Civil War. That surprised me – I didn’t know that there were any Chinese Americans who fought in that war! He went on to serve in the army for 30 years. Cohota thought his long years of service would grant him citizenship, but he didn’t get his papers completed before the Chinese Exclusion Act and never became a citizen, a story echoed today of what has happened with some current immigrants in the military. Conspicuously missing was any mention of Major General Antonio Taguba. Taguba, as you may recall, was responsible during the Iraq War for compiling a report on prisoner abuse at Abu Ghraib prison which was leaked in 2004. He was asked to retire in 2007. Lou Sing Kee, a WWI War hero, was not listed. I also learned that he was even mentioned (as Sing Kee) in a Stevie Wonder song called Black Man. Despite a few omissions, I still think it is a list worth reading (see the other Chinese American who fought in the Civil War). For other Asian American veteran stories, I suggest checking out Koji Sakai‘s graphic novel 442. StoryCorp’s Military Voices project has many moving Veteran stories, such as this one that we that highlighted on a Memorial Day and this one on a past veteran’s day. “”Yappie” is a single-camera comedy that explores the social and racial issues related to the contemporary Asian American experience from the perspective of Andrew and his bubble of friends who are all “yappies”[a slang word to describe a “young Asian professional who acts like a yuppie.”]. Also, the first season does dig into the awkward social stratus of where Asian Americans are found among our multi-cultural society within the United States. We’re definitely not treated like whites, but not like African Americans, Hispanics or Native Americans. As someone who is way more politically involved than my fellow Asian Americans, I feel as though Yappie also exposes how apathetic Asian Americans can be in living in their own bubble – especially as portrayed in Yappie, which takes place in LA / Southern California. I think Asian Americans have a different kind of experience elsewhere in the U.S., especially in states with not a lot of Asians or other minorities. Below, after the break, are all five episodes of the first season of Yappie. Image courtesy of NBC News. “On Monday, Oct. 20, 2014, Sherry Chen drove, as usual, to her office at the National Weather Service in Wilmington, Ohio, where she forecast flood threats along the Ohio River. She was a bit jet-lagged, having returned a few days earlier from a visit to China. But as she headed to her desk, she says, she had no reason to think it was anything other than an ordinary day. Then her boss summoned her. Once inside his office, a back door opened and in walked six agents from the Federal Bureau of Investigation. The agents accused Mrs. Chen, a hydrologist born in China and now a naturalized American citizen, of using a stolen password to download information about the nation’s dams and of lying about meeting with a high-ranking Chinese official. Mrs. Chen, 59, an adoptive Midwesterner who had received awards for her government service, was now suspected of being a Chinese spy. She was arrested and led in handcuffs past her co-workers to a federal courthouse 40 miles away in Dayton, where she was told she faced 25 years in prison and $1 million in fines. I actually got to meet Chen in Palo Alto where she was a guest for a talk on “A Seminar on Trade Secrets and Economic Espionage: Legal Risks in Advancing Technology between the U.S. and China.” Although I’m an American-born Taiwanese American, I have worked for two Chinese companies, so I am acutely aware of the possible discrimination against Asian Americans. In fact, I remember finding out that one of my Mom’s church friend’s siblings was Taiwanese American scientist and falsely accused spy Wen Ho Lee. “Yet the National Weather Service terminated her from employment doing the job she loved at its offices near Cincinnati, Ohio. Determined to stand up and speak out, Sherry challenged the termination decision through the Merit Systems Protection Board, an administrative system meant to protect hard-working public employees such as her. On April 23, the decision was issued that ordered she be returned to her work on behalf of the public and be given backpay. The Commerce Department has planned to appeal the ruling, so she still does not have her job back. Several Asian American organizations released this joint communique condemning the appeal. There are legitimate cases to prosecute when it comes to Asian Americans and espionage for national or commercial means, but with the increasingly mostly economic rivalries between the United States and China, the U.S. must ensure that the proper due diligence is applied before more innocent Americans are wrongfully charged and terminated. One of the things I have really enjoyed after having moved to the San Francisco Bay Area in 1999 has been attending the San Francisco Asian American International Film Festival, which is now known as CAAMFest, now its 36th year. This year’s opening night premiere was a documentary – AN AMERICAN STORY: NORMAN MINETA – about groundbreaking elected official and civil servant, Japanese American Norman Mineta – the first Asian American elected to San Jose, California City Council, first Asian American elected to be mayor of San Jose (first Asian American mayor of any major city in the continental United States), first Asian American Congressman elected in the continental United States, first Asian American to serve as a cabinet member to serve a President (AND also both in a Democratic and Republican administration). 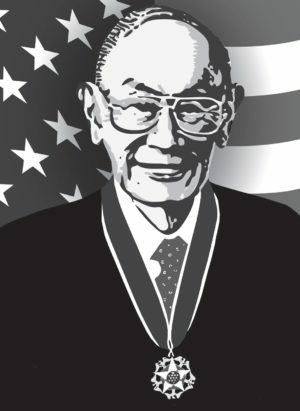 AND first Asian American to have an airport named after him (Norman Y. Mineta San Jose International Airport). After watching the documentary, I realized that although I had kind of known about many of Mineta’s accomplishments, seeing his story told in its totality was amazing. (This slightly differed from my experience watching a documentary about Patsy Mink, another amazing Asian American, but someone I knew nothing about until a CAAMFEST screening). Mineta is a truly ground-and-glass-ceiling-breaking Asian American that all Americans should learn about. “Backlash to a proposed name for a Palo Alto middle school has provoked surprise and confusion among Japanese-American residents who don’t see the connection between Fred Yamamoto, the Palo Altan who was held in Japanese internment camps and later died in combat, and Isoroku Yamamoto, the reviled marshal admiral who ordered the bombing of Pearl Harbor. “Yamamoto is an extremely common name. I understand why these people don’t want a school named after Isoroku Yamamoto, but Fred Yamamoto shouldn’t lose out just because he has the same last name,” Yusa-Ogawa, a Los Altos High School graduate, told the Post. When I had heard about this, I was completely dumbfounded, but not totally surprised. I know some first generation Chinese Americans that harbor anti-Japanese feelings due to World War II. However, first and foremost, Fred Yamamoto was born-and-raised in the United States and is an American of Japanese decent – and died in combat for our country. As far as I’m concerned, Yamamoto is an American hero. I think a lot of Asians in Asia and Asian Americans still confuse or conflate race with nationality. Fred Yamamoto was not related at all to Japanese Admiral Isoroku Yamamoto. I’m sure most Americans don’t even know who Admiral Yamamoto is! My Japanese and Japanese American friends noted that Yamamoto is a very common Japanese last name. 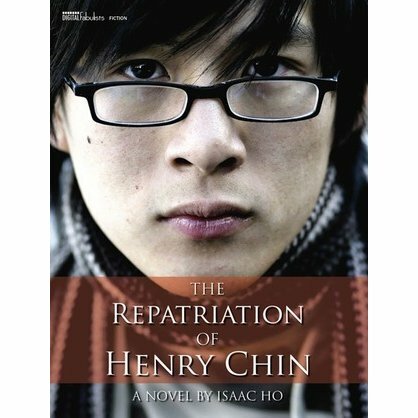 The Repatriation of Henry Chin, written by Issac Ho and read by Anthony Lee on audiobook, is about a future where the United States has been in an escalating trade war with China which eventually leads to the roundup of all Chinese Americans into “internment” camps—a la, the Japanese Americans during World War II. This book is a powerful reminder of what could happen to us—as Americans—when we let our fears get the best of us. It’s scary to imagine an assembly center in this day and age at the Rose Bowl in Pasadena. Or just the idea that you can even lock up an entire group of people for no other crime than being the “wrong” race or ethnicity. In the book, we follow Henry Chin, who was an ex-military guy turned pharmacist. He’s been trying to live low and raise a hapa daughter after a traumatic war experience in Panama. However, when they start rounding up Chinese Americans, he refuses to comply. He takes his daughter and together they make a run for Canada through the Angeles Crest mountains—with the help of Henry’s army buddy. My one problem with the story—and don’t get me wrong, this should not deter anyone from reading it—was how Japanese Americans were depicted. There was one part early on when the narrator states that Japanese Americans were wearing Japanese flags to make sure everyone knew they weren’t Chinese. I have a hard time imagining Japanese Americans doing this on many levels. First, we would never wear Japanese flags. And second, we would never sit idly by and allow the government to lock up a whole group of people again. The concentration camps during World War II scarred the Japanese American community. We still talk about what happened today. It is not hyperbole to write that if a group of Japanese Americans get together, the word “camp” will come up—multiple times. Personally, I’ve dedicated much of my working life to teaching other people about it. We—as a community—have made it a point to make sure it never happens again to anyone ever. After 9/11, Japanese Americans were one of the first groups to come to the defense of Muslim/Arab Americans. So, the idea that Japanese Americans would sit by and do nothing is crazy. Regardless, The Repatriation of Henry Chin is an important reading for all Americans. I tell people all the time: Today they might be coming after someone else. But if you don’t fight for their rights, tomorrow they could be coming after you. So go out and get this book on Audible or anywhere else audiobooks are sold. Please note that I received this title for free in exchange for an unbiased review. Be sure to follow me on Twitter @Ksakai1. Every year since the kickoff year in 2011, I’ve tried to make the annual Fred Korematsu Day of Civil Liberties & the Constitution in the Bay Area. This year, I was particularly interested since after watching the movie The Post (about The Washington Post and its reporting of the Pentagon Papers, which was leaked by Daniel Ellsberg), the keynote speaker this year was was Daniel Ellsberg, who apparently lives in Northern California. Ellsberg did not disappoint! Ellsberg’s keynote was I thought, very thought provoking, discussing that the Trump America we know today existed before Trump was elected. Ellsberg also thought that if there was another “9/11” event that there would be indeed Muslim concentration and deportation camps. Ellsberg said the events of Charlottesville with the white supremacist and Trump and Trump’s administrations’ racist attitudes and that a very large fraction of America is actually represented by Trump. Some may want just jobs, and not all are racists, homophobes, misogynists, etc… it is not 1% There are a lot of contradictions in American, like the first 11 out of 15 presidents of the United States owned slaves, 8 of them while they were president. I think the last time I wrote about Shark Tank was when 3 Korean American women were trying to raise money for their dating app, Coffee Meets Bagel, where one sister (I think the one that went to Stanford for her MBA?) turned down a theoretical offer of $30 million from Mark Cuban. Well, I was watching the premier episode of Season 9 of Shark Tank (originally airing on Sunday, October 1st, 2017), and saw Korean American and fellow Duke alum Yunha Kim (not to be confused with *the* Yuna Kim) – who I actually met briefly a year or two ago at a Duke alumni event in San Francisco – trying to raise money for her company and namesake meditation app, Simple Habit. “The $12 million valuation she was putting on Simple Habit was, for Shark Tank, probably one of the highest ever. She felt it was worth it, though, because she already had a built-in user base and other investors. Kim knows she has a hit on her hand, especially given the popularity of apps like Calm and Headspace. For Mark Cuban, that’s where it all fell apart. Kim was having trouble explaining why she needed to get a shark involved with her business when she already had plans to get other celebrities and influencers involved. There’s also the matter of her prior rounds of investments and the fact that she’s coming from Silicon Valley, a place the investors on Shark Tank are notoriously wary of. (“The Valley takes over,” Cuban groaned when Kim started her pitch.) They usually feel like the entrepreneurs are pitching into the publicity void, since they’re already set for money. Personally, I was a bit disappointed in Mark Cuban using that term. I understand Cuban’s concern about other entrepreneurs using Shark Tank as he termed it, a “growth hack” to get the publicity and growth resulting for appearing on Shark Tank without really needing to attract investment capital. Cuban could have more artfully said that Kim was using Shark Tank as a publicity vehicle or was seeking the limelight. In her defense, guest “shark” Richard Branson called out Cuban on his remark, and Cuban later was backpedaling to explain himself. But it was a bit too late for Branson as he threw a cup of water on Cuban (and vice versa). Personally, given the years I’ve watched Shark Tank, I don’t think Cuban is sexist, but I do think calling Yunha a gold digger was definitely not appropriate. Part 2 of the press conference here. “U.S. Figure Skating announced today the men who will compete at the Olympic Winter Games PyeongChang 2018 as part of the U.S. Olympic Figure Skating Team. The men’s singles team is Nathan Chen, Adam Rippon and Vincent Zhou. Nathan Chen is the 2018 U.S. champion, successfully defending his 2017 title. Chen entered the 2018 U.S. Championships as the only undefeated male skater in the 2017-18 season, winning two Grand Prix Series titles and the Grand Prix Final. Chen is the only man in the world to receive credit for landing five different types of quadruple jumps in international competition. Adam Rippon is the 2016 U.S. champion, and placed fourth at the 2018 Prudential U.S. Figure Skating Championships. After winning silver at both of his Grand Prix Series assignments this season, Rippon earned his second-straight trip to the Grand Prix Final, where he placed fifth. Vincent Zhou is the 2018 U.S. bronze medalist. He won the 2017 U.S. silver medal and ended last season as the 2017 World Junior champion. Chen has won U.S. titles at the intermediate (2011), novice (2012) and junior (2013) levels. There was absolutely no doubt, especially after Saturday’s performance, that Nathan Chen would be named to the 2018 U.S. Men’s Olympic Figure skating team. However, the second two spots were up for grabs after some disastrous performances by Adam Rippon and Jason Brown at Nationals. Ultimately, Rippon was selected to be part of the team due to his body of work the past year and beyond. Palo Alto native Vincent Zhou, was selected as the third member of the men’s figure skating team. To be honest, I don’t really follow Zhou even though he lives in the next town over, and only usually follow figure skating during the Olympics unless I happen to catch it on TV. To be honest, I was a little surprised that Zhou had received such a tweet, since I had not heard of other such racist tweets regarding Mirari Nigasu, Karen Chen or even Nathen Chen. But in the press conference, Zhou reiterated what he had tweeted. After that response, I felt that I was definitely happy to have asked my question regarding Zhou and his Asian American background. I think at this point in time, Chen is highly likely to medal at the Olympics and has a very good chance to win the Gold. 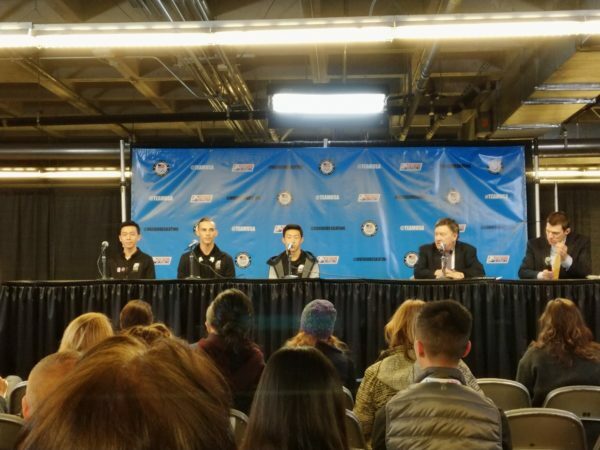 From the past few days of observing Chen, he is supremely confident and a bit stoic and a bit matter-of-fact, something that his teammate Adam Rippon said that he was quite the opposite (with Chen nodding in approval of his description of their skating styles and personalities).